There are those who believe being a vegan athlete or bodybuilder is impossible, but what these people don’t realize is that it is possible to build up your muscular strength on an all natural, vegan diet. Here’s how to choose the best vegan pre-workout supplement. Sure, it takes some extra time to find workout supplements that are vegan, but that doesn’t mean it is impossible to boost your daily routine with a high-quality pre-workout formula. What’s a Pre-Workout Supplement Anyway? Why should you Choose organic & vegan pre-workouts? Pre workout supplements that are not all natural are not inherently bad, however, so I haven’t discluded those from this list. Rather, this list focuses on helping those who keep a strictly vegan diet find a supplement that they can take without worrying that any of the ingredients come from animal sources. I will mention up front that not all of these products are vegan certified, but they are all currently being used by vegan athletes who have examined the ingredients list to determine that they can be considered vegan. Getting vegan certification on their products is something that many workout brands have not yet done; we can only hope that they will put a higher focus on doing so in the future. Now that we’ve got that out of the way, let’s take a closer look at five fantastic vegan pre workout powder supplement reviews that will help you make gains in your training every single day. First up on our list of the best vegan pre-workout supplement options is VINTAGE BLAST. This completely vegan product is a two-stage pre workout supplement. VINTAGE BLAST is focused on ensuring that users not only gain as much information as possible about the main ingredients included, but they’re adamant in revealing every single ingredient that goes into the product. Fillers and unnecessary color or flavor additives that are found in many other workout products are avoided. Since this product has caffeine in it, when you take it, you may get a slight tingly or jittery feeling, but the product's formula ensures that this effect does not wear off as you use it for a couple of weeks. So you know it's continuing to work. As the best vegan pre-workout powder in this review, it delivers what it promises, and the constant influx of energy will give you that extra push in the gym. This product tastes great, and will get you a long and steady boost whenever you need it. Unlike many other supplements that use artificial sweeteners, VINTAGE BLAST is sweetened with stevia, a natural, zero calories sugar substitute. Some people might take some time to get used to the different sweeter flavor. Also, there can be some slight difficulties with dissolving the supplement in water, since it can take a while it’s completely dissolved. However, this minor flaw isn’t enough to keep us from ranking this our #1 choice. Next up we have the Red Leaf Pre-Workout Energizer supplement. This vegan product is packed with healthy, natural sources of energy as well as antioxidants to keep your body in tip-top condition. It can offer all that, and without making you feel jittery or on edge. The expertly mixed ingredients work in tandem to give you enough energy to complete your goals, in the gym or out. These ingredients, as well as others in the formula, support your body to naturally have stronger workouts, a nitric oxide boost, and even better post-workout recovery effects. It doesn't matter what activity you’re involved in, be it running, weight lifting or swimming, this delicious pre-workout supplement will get you where you want, without you making crash on caffeine. One more thing a lot of people love about this product: it is a no carb supplement, and so you won’t experience a boost while crashing an hour later. Even so, the biggest advantage of this product, the low amount of caffeine may for some be its biggest drawback. If you’re not so sensitive to caffeine anymore, you might need to up the dose to feel a punch. Another great vegan pre workout powder is the Vega Sport Pre-Workout Energizer. All products from Vega are targeted towards vegans, which means that this pre workout energizer was created with a lot of care for vegan athletes. Additionally, it is free from dairy, gluten, and soy as well as low in sugar, making it a great choice for those with restrictive diets as well. These natural ingredients are perfectly blended to help you have a better, longer workout. The mix of the ingredients delivers a product that won’t left you jittery or cause a complete break down with continuous use. The supplement is pretty quick to dissolve in water, and using it with a shaker will make the process even faster, so you can spend more time putting its effects to good use. For all the benefits it’s packing, this pre-workout vegan supplement can taste a bit strong for new users. Again, the main complaint after the taste is that the product just didn’t affect some people already used to a high daily caffeine dose. The Garden of Life Sport Organic Pre Workout Energy Plus Focus Vegan Energy Powder is a great option for those with vegan diets who also want extra energy to get through their daily routine. This product boosts your energy and focus with clean organic coffeeberry fuel. It also increases your bodies NOs with a unique, vegan blend of organic kale, spinach, and beets. These vegetables all have high levels of nitrates and are perfect as a vegan energy drink while working out. Even so, if you’re expecting a quick and dramatic boost, you’ll be disappointed. This product delivers what it promises, that’s for sure. But it’s more in terms of steady and hours long energy boost that may be less noticeable at first. The supplement also contains a great boost of Vitamin B12 which is essential for athletes and vegans who often have low B12 levels. Vitamin B12 helps metabolize fats and carbs as explained on this article on Health Listed. And with only 55 calories per serving, this supplement will make a great addition to your diet and exercise regime. Unfortunately, it’s a pain to mix it with water, so make sure you have your shaker with you for an easier time getting to use the product. The main boast of Organic Muscle are the lack of jitters or itchy skin while using the supplement. And I can say, it delivers. Available in lemon berry flavor, this supplement will be a piece of cake to drink and will even satisfy the most demanding users. When it comes to ingredients, this supplement uses only organic, eco-friendly USDA farms, making it one of the more environmentally conscious brands. The company Organic Muscle is known as the first offering users certified organic supplements, and all their products are gluten and dairy free, chemical and hormone free, preservative free, certifiably organic and Non-GMO. While using the product, you won’t find yourself wide awake in the early hours of the morning, and your daily life will be free of digestive issues and headaches that are sometimes caused by similar products. And while it tastes great, there are still some concerns about the dosage. To get the best boost, some people have reported, you should try to up the dose. And the biggest con with that, it makes the product a bit expensive. 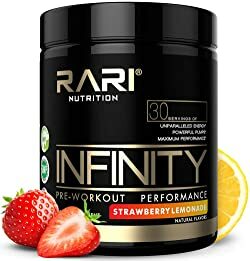 Whether your goal is to get better results in the weight room, or just experience an increased muscle pump, RARI Nutrition Infinity is for you. The clinically proven ingredients work together to help you get on the next level, when it comes to your fitness and endurance. Also, without any potential side effects that are most commonly jitters and headaches. This pre-workout supplement also boasts a Good Manufacturing Lab certificate, and that means all ingredients are tested and safe for use. Also, the taste is fantastic, and you’ll be looking forward to your next dose. If you’re looking for a product that’ll make you more focused on your workouts while helping you progress in the gym, this combination of Thiamin, Vitamin B6, Vitamin B12, Caffeine, Black Pepper Extract, and a lot more ingredients, will help you achieve that. Paired with natural colors and sweeteners, this product delivers great effects, without sacrificing the natural philosophy behind the brand. With a short time to kick in, RARI nutrition pre-workout supplement will get you quite a punch, even if you have already built a tolerance to similar products. Some people have noticed that their flavoring aren’t all that good, so I suppose that can count as a flaw. Aside from that this is a solid product for anyone looking for a ketogenic- and/or vegan-friendly option. Pre-workout products can raise your workout to a whole new level. You will not only increase your strength and endurance, but also increase protein synthesis, accelerate metabolism, reduce muscle loss, and create enough hormones for optimal muscle growth. Not all supplements for pre-workout are the same. It’s best to must always choose those with active ingredients and powerful herbs. Because of its caffeine content, green tea has decent thermogenic effects, so you'll find it on the list of most products. Use pre-workout supplements that contain taurine or creatine if you want more power and energy. High doses of BCAA, whey protein, and fast digestible carbohydrates are associated with muscle growth. Use citrulline malate, beta-alanine, antioxidants, N-acetylcysteine, and alpha lipoic acid products to increase stamina. These ingredients will increase your energy, delay muscle tiredness, and speed up recovery between training. Some pre-workout supplements protect red blood cells from damage and improve blood flow during exercises. Pre-workout supplements can be used by men and women alike. They are ideal for both beginners and advanced practitioners. The pre-workout supplement has many positive effects on the human body's cells that the bodybuilders have long recognized and started to extract the most useful from to bring their training to the next level. They play an important role in transmitting information between cells by acting as neurotransmitters and, in particular, can boast the ability to enlarge the veins and blood vessels to facilitate flow of blood. The difference between the most common supplements produced with unhealthy products based on animal sources and vegan (herbal, plant-based) supplements is the advantage that natural ingredients can offer. Organic ingredients are pesticide and additive free, as well as easy to digest. To the person using them they’ll be able to provide all the benefits without any health disadvantages. Reliable nutrition and smooth energy boost are provided by the clean ingredients. When used in conjunction with a balanced diet, vegan supplements can be a fast and easy way to ensure that you get precisely all your body needs. You can’t go wrong starting your workout off with a scoop of our #1 recommended Vintage Blast Pre-Workout. And if you’re on a tight budget, you can give Garden of Life Sport a try to see substantial benefits at a lower cost. I hope that this list has helped you find the best vegan pre-workout supplement for you that will help you keep a plant-based lifestyle even while working on building up your body for a stronger physique. You can even try out DIY snack options from our huge list here. Protein, energy supplements, and other common ingredients in workout supplements do not need to come from animal sources, so it is possible to still use these boosters while keeping a vegan diet. While some added ingredients like creatine ​can be harder to find from non-animal sources, don’t give up on your search. These six reviewed options should help you get there faster! Do you keep a vegan diet, including with your pre workout supplements? If you have tips for other plant-based athletes, make sure to share below so that they, too, can keep their power and performance levels at an all time high!